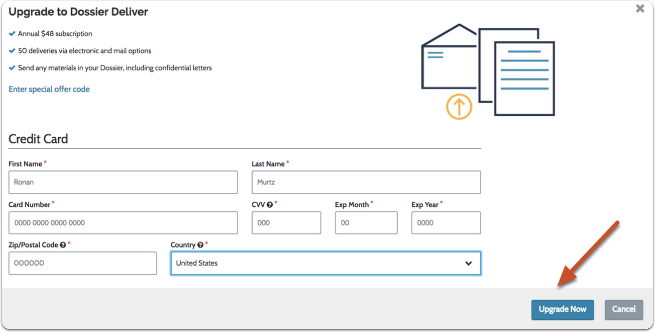 With Dossier, you can request, collect, and organize your academic credentials and confidential letters and other career materials. 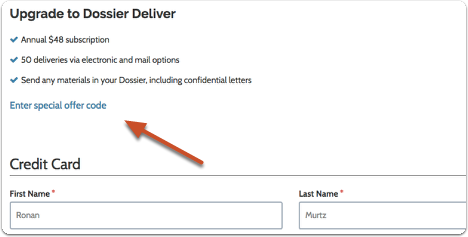 When you upgrade to Dossier Deliver, you can send those confidential letters and academic materials by post, email or to online application systems when applying to faculty jobs, post-docs, fellowships, and more. 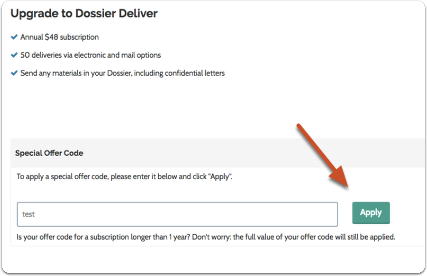 Click "Enter special offer code"
Enter your code and click "Apply"
if your code is for a subscription longer than a year, we will apply the full value of your offer code. Enter your name and billing information and click "Upgrade Now"